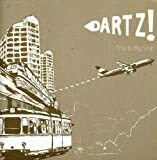 Debut album This Is My Ship released 12.02.07 on Xtra Mile Recordings Ltd.
Teesside trio DARTZ! release their debut album This Is My Ship on 12th February 2007 through Xtra Mile Recordings Ltd. Recorded with Mark Williams (Fightstar, Yourcodenameis:milo, Million Dead) at Criterion Studios in the legendary Battery Studios complex in North West London, This Is My Ship documents the sounds DARTZ! have been creating since their first gig back in March 2005. From Teaching Me To Dance, the first song they wrote together as a band, to more recent offerings such as St. Petersburg, the album offers up twelve energetic, intelligent and exuberant tracks showcasing William, Henry and Philips ability to produce genuine, clever and exciting pop. If you ask DARTZ! about their influences, Philip is likely to start referencing authors such as Hemingway and Dostoevsky or visits to New York City and Prague. Itd certainly be fair to say that DARTZ! are influenced equally as much by the places theyve visited, the books theyve read and their life experiences as by the music that they listen to. Guitarist Henry isnt quite as literacy orientated as William and Philip, in fact, Our Band Could Be Your Life by Michael Azerrad is pretty much the only book hes read from start to finish for quite some time. However, neither his nor his band mates love of the American Indie Underground ends in 1991 like the aforementioned book, with Washington DC greats like Q and Not U, The Dismemberment Plan and Faraquet all being relevant sources of inspiration. For a band that initially started as a one gig joke between a drummer and a guitarist who thought itd be funny to swap instruments, the last two years havent exactly stuck to the script. Within 6 months of their first gig and just 9 months after Henry and Philip first picked up their new found instruments, DARTZ! played an explosive set at Manchesters In The City event alongside iForward, Russia!, The Fratellis and The Maccabees. It wasnt long before Steve Lamacq was singing their praises and making them his Unsigned Band Of The Week on BBC 6 Music whilst XFMs new music guru John Kennedy was regularly playing their demos on his show and championing them at every available opportunity. Much of 2006 was spent on the road with the likes of Get Cape Wear Cape Fly, The Rumble Strips, Stapleton and The Research, as well as one off dates with such luminaries as The Futureheads and 65 Days Of Static and a couple of critically acclaimed performances at the inaugural Great Escape festival in Brighton. DARTZ! kick off 2007 supporting their good friends Hot Club De Paris in January before heading out on their own headline tour in February and March. Its looking like being an exciting year for DARTZ! with Rock Sound Magazine putting them in their Hot 100 for 2007, Big Cheese Magazine picking ‘This Is My Ship’ as one of the Big Ones of 2007 and new music juggernaut James Jam recently proclaiming that DARTZ! are his new favourite band. William K.J. Anderson plays bass and sings too. Henry J. Carden plays guitar. Philip J. Maughan plays drums and sings a little bit too.